Transparency Market Research offers an eight-year forecast for the global date palm market between 2018 and 2026. In a recently released report by the company, the global organic pea protein market is expected to register a CAGR of 8.0% during the forecast period. The primary objective of the report is to offer insights on the advancements and opportunity in the organic pea protein market. The study demonstrates market dynamics that are expected to influence the current challenges and future status of the global organic pea protein market over the forecast period. This report also offers updates on trends, drivers, restraints, value forecasts, and opportunities for manufacturers operating in the global and regional organic pea protein market. The general awareness that healthy food emanates at the cost of taste has been positively blurred out in the health food industry, as manufacturers have improved their products to such an extent, that taste is no more a negative factor as far as protein products are concerned. Improved ingredient quality and the introduction of newer process technology has made pea protein available in varied types, some of which are only unique to protein processing. A consistent supply of proteins is considered absolutely essential for muscle growth, as protein helps in building muscle mass and repairing damaged muscle tissue. Due to this reason, the consumption of protein powders is a fairly common phenomenon among fitness enthusiasts and regular gym-goers. Plant-based proteins are particularly popular as supplements, due to functional advantages such as high solubility in a liquid medium and the presence of vital nutrients. An increasing vegan population has led to an increase in the demand for plant-based protein. Plant proteins are finding increasing application in sports nutrition products, since they are perceived to be natural and additive-free. For instance, the demand for plant-based protein such as organic pea protein is increasing among athletes, as it is pure, natural, non-GMO, enriched with amino acids, and can be easily mixed with beverages and food products. Product innovations regarding growing health concerns have changed the market dynamics on a global level. Increasing offerings by vendors using safe and healthy ingredients is responsible for the growing demand for supplements and sports food. With changing lifestyles and increasing focus towards plant-based food products, consumer sentiments are oriented towards consuming food that is guilt-free in order to protect the environment. Vegan food products have gained considerable traction in the market, and hence, these consumers are opting for more plant-based products, such as pea protein. Hence, plant-based proteins satiate multiple consumer demands, such as gluten-free, vegan, and high-protein food products. In recent times, pea protein has gained considerable traction in the market, especially among flexitarians and consumers following plant-based diets in their daily routine life. The price of plant-based protein is one of the factors that is considered by consumers while buying a plant-based protein product. Consumers have expressed concerns over the prices of plant-based and organic food products, which are relatively higher in comparison to animal-based and conventional protein. Under such circumstances, these expensive prices of organic plant-based protein products are likely to affect market growth in a bigger way than it appears, as positive consumer approach towards organic plant-based products is not very mature, and high prices may drive away even those consumers who are ready to opt for plant-based diets. A section of the report highlights the global demand for organic pea protein. It also provides a market outlook for 2018–2026 and sets the forecast within the context of the dates. This study discusses key drivers, and opportunities contributing to the growth of the global organic pea protein market, as well as analyses the degree to which drivers are influencing the global market. In the final section of the global organic pea protein report, a competitive landscape has been included to provide report audiences with a dashboard view. Key categories of providers covered in the report are global organic pea protein key players. 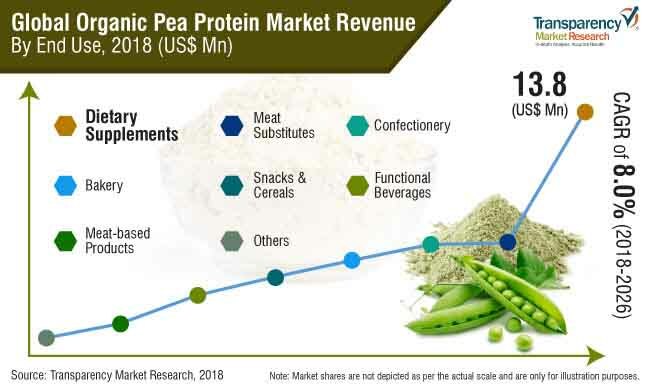 Detailed profiles of the providers are also included in the scope of the report to evaluate their long-term and short-term strategies, key product offerings and recent developments in the global pea protein market space. Market participants in the global organic pea protein market include, Farbest Brands, Axiom Foods, Inc., The Green Labs LLC, Bioway (Xi'an) Organic Ingredients Co. Ltd., The Scoular Company, Vestkorn, YT (XI’AN) Biochem Co., Ltd., A&B Ingredients, Greenway Organics (Tianjin) Co., Ltd, Phyto-Therapy Pty Ltd., Puris, and Maxsun Industries, Inc. The Transparency Market Research report on global Organic pea protein market analyzes opportunities in the market and presents updates and insights pertaining to various segments of the global Organic pea protein market over the forecast period, 2018–2026. This report, provides forecast and analysis of the global Organic pea protein market. It provides actual data of 2017 along with estimated data of 2018, and forecast data up to 2026 in terms of revenue (US$ Mn) and volume (MT). The report includes share of top pea producing countries in the world, export/import volume and value of Pea of top exporting and importing countries and industry value chain analysis. The report also comprise of macroeconomic indicators along with an outlook on Organic Pea Protein for the global market. It includes drivers and restraints of the global Organic Pea Protein market and their impact on each region during the forecast period. Report also includes ongoing trends and market opportunities for Organic pea protein producers in the end use industry such as dietary supplements, meat substitutes, bakery and confectionery, snacks & cereals, meat-based products, functional beverages and others. The study encompasses market attractiveness analysis by nature, end use, variety, form and region. In order to provide users of this report with comprehensive view of the market, we have included detailed competitiveness analysis and competition deep dive of companies engaged in the business of Organic Pea Protein. Report comprised of information related to key players of Organic Pea Protein market, their strategic overview and recent developments in their business areas. The report also includes types and forms of Organic Pea Protein offered by key players across North America, Europe, Asia Pacific, and Middle East and Africa. The Organic Pea Protein market is segmented on the basis of product type, end-use, and region. On the basis of product type, the global Organic Pea Protein market is segmented into, isolates, concentrate, and texturized. Currently, demand for organic food is trending in the global market as consumers are making themselves aware of the healthy ways of living. Constant checks on the certification of organic products and the use of composed manure have surged the demand for organic products in the global market. Consumers prefer organic products due to the multi-nutrient profile accompanied by the absence of toxic chemicals and pesticides and owing to this the demand for organic pea protein is also increasing in the global market. This report covers market dynamics related to Organic Pea Protein that includes drivers and trends driving each segment and opportunities in Organic Pea Protein market. Report also includes analysis and insights into the potential of the Organic Pea Protein market in specific regions. Detailed profiles of the providers are also included in the scope of the report to evaluate their long-term and short-term strategies, product portfolio of Organic Pea Protein manufacturers and recent developments in the Organic Pea Protein space. Company profiles also includes regional presence of organic pea protein manufacturers and in the regions where the manufacturers offers their products. Organic Pea Protein market participants includes Farbest Brands, Axiom Foods, Inc. , The Green Labs LLC, Bioway (Xi'an) Organic Ingredients Co. Ltd., The Scoular Company, Vestkorn, YT (XI’AN) Biochem Co., Ltd., A&B Ingredients, Greenway Organics (Tianjin) Co., Ltd, Phyto-Therapy Pty Ltd., Puris, and Maxsun Industries, Inc. The data analysis for global Organic Pea Protein market is estimated in terms of value and volume consumption. To arrive at the volume consumption of Organic Pea Protein, production data of countries producing pea across the globe has been taken into consideration. In addition to, the production of pea varieties in top producing countries is also tracked and further their import-export in the global market is tracked for understanding consumption in key countries. The market analysis for organic vs. conventional growth of pea is derived for further understanding the share of organic pea market in overall pea production, The consumption of pea is further analyzed and processed products derived from pea are tracked to analyzed the pea protein market. The processed product derived from organic pea are analyzed to derive the consumption of organic pea protein. Furthermore, Transparency Market Research estimated volume data on consumption of Organic Pea Protein for several countries by understanding the demand and supply of Organic Pea Protein. It includes production, growth, volume and value sales, transition, pricing, per capita consumption, population, consumer preference, and consumption of organic pea protein among end user verticals is scrutinized. TMR then determined the volume consumption of Organic Pea Protein across various regions including North America, Latin America, Asia Pacific, and Middle East and Africa. Forecasting is done on internal proprietary model using different macro-economic, industry-based demand driving factors impacting the market and its forecast trends. By identifying and allocating a weighted score to forecast factors that influence the demand for Organic Pea Protein. These factors were the representative of an entire value chain, as well as the macro-economic indicators such as production, per capita consumption of organic pea protein, per capita spending on food products have been taken into consideration to arrive at the volume consumption of organic pea protein in respective countries. Weighted average selling price for Organic pea protein was considered to estimate the market size for top Organic pea protein consuming countries. These prices were captured in their respective countries and then converted into USD to offer forecasts in one consistent currency standard. Given the characteristics of the market, TMR triangulated the data based on supply side, demand side, and dynamics of the global Organic Pea Protein market. To develop the global Organic pea protein market forecast, TMR analyzed various factors to understand their respective impact on the target market. However, quantifying the market across the abovementioned segments is more a matter of quantifying expectations and identifying opportunities rather than rationalizing them after the forecast has been completed. Another key feature of this report is analysis of the global Organic pea protein market and the corresponding revenue forecast in terms of absolute dollar opportunity. This is usually overlooked while forecasting the market. However, absolute dollar opportunity is critical in assessing the level of opportunity that a provider can look to achieve, as well as to identify potential resources from a sales perspective in the global Organic pea protein market. To understand key segments in terms of their growth and performance in the global Organic Pea Protein market, Transparency Market Research has also presented a market attractiveness index. The resulting index should help providers identify existing market opportunities in the global Organic Pea Protein market. The report covers an in-depth analysis of all components of value chain in the global Organic Pea Protein market. In the final section of the report on the global Organic pea protein market, competitive landscape is included to provide a dashboard view of global Organic pea protein manufacturers.